The integration allows plant maintenance personnel to monitor the water purification system from any BAS workstation in the plant. Merck Sharp & Dohme Technology operates a major pharmaceutical plant in Singapore. They retained Andover Controls, a global provider of building automation solutions, to implement a water purification system and integrate it with a Building Automation System (BAS). The integration allows plant maintenance personnel to monitor the water purification system from any BAS workstation in the plant. Critical alarm points are transferred to all of the operator stations of the plant information system so operators can be properly notified. An Allen-Bradley PLC-5E was used in the water purification system in conjunction with Rockwell's RSLinx OPC server. Andover's Continuum controllers handled the BAS and also had their own OPC server. 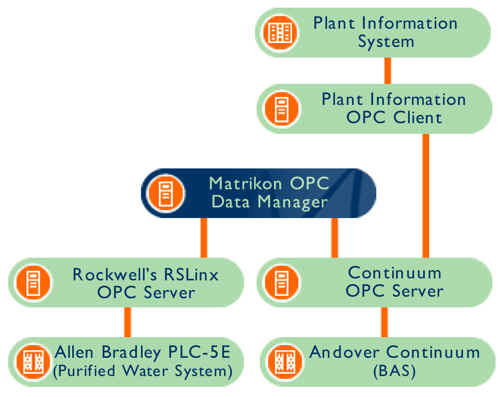 In order to transfer data from one control system to the other, Matrikon's OPC Data Manager was integrated. OPC Data Manager acts as a double-headed client that enables two servers to communicate. Abdul Rashid Karyeo, Operations Manager for Andover Controls Singapore, had previously integrated Matrikon OPC products and again chose Matrikon OPC to establish the required connectivity. Although this was the first Matrikon OPC installation by Andover in Singapore, Andover Controls have used Matrikon OPC in more than 20 sites across the USA and Europe. There are 24 points mapped between the purified water system and the BAS, including digital alarm points and analog readings. All the points are read from the purified water system and written to the BAS by the Matrikon OPC Data Manager via the respective OPC servers. Points are updated every 5 seconds. OPC is plug-and-play technology, so the integration went smoothly and no support from Matrikon was required. "Matrikon's OPC Data Manager is easy to procure, implement, operate and support, and there have been no problems with the product. The interface is very stable," says Karyeo. "We are currently developing a new system proposal with Matrikon OPC solutions for our other new plant designs and plan to have these implemented this year." Andover Controls Singapore is a branch of Andover Controls Corporation based in Andover, Massachusetts. ACC is a global supplier of building automation solutions and has utilized Matrikon OPC solutions at many sites in the USA, Europe and Asia. MatrikonOPC is the world's largest OPC developer, with a collection of over 500 interfaces. Boasting more than 30,000 users and over 100,000 installations around the world, MatrikonOPC provides connectivity to every major control system and application on the market. These products and solutions are the culmination of Matrikon's experience since 1988 in the design and implementation of device-specific communication drivers. Their vendor interoperability and OPC compliance are guaranteed which helps make them the global leader in industrial connectivity. OLE for Process Control (OPC) is a published technology designed to bridge Windows based applications and process control hardware. 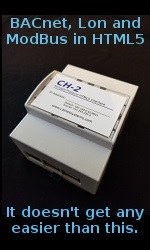 It is an open standard that permits a consistent method of accessing field data from plant floor devices. This method remains the same regardless of the type and source of data. Therefore, end users are free to choose the software and hardware that meets their primary production needs, without having to consider the availability of proprietary drivers. OPC components fit into two categories: OPC clients and OPC servers. A client is typically a data sink -- an application that uses data in some way, such as an HMI or SCADA package. A server is a data source - a device specific program that collects data from a field device, and then makes it available to an OPC client. A client interacts with a server using a well defined OPC interface. Therefore, any OPC client can communicate with any OPC server, regardless of the type of device the server is designed to collect data from. Hundreds of off-the-shelf OPC servers and clients are available today from many different vendors throughout the world. OPC is built using Microsoft's OLE technology, which is a well tested and proven foundation. Also, the OPC specification was designed by an open foundation to meet the general needs of industry - not the specific needs of a few software or hardware manufacturers. The specification also provides for a robust evolution of functionality over time, so OPC components can stay on top of the emerging needs of industry.